Popular comedy hero Allari Naresh’s upcoming comic caper, James Bond, has finally been confirmed for a July 17th release as a Ramzan treat. 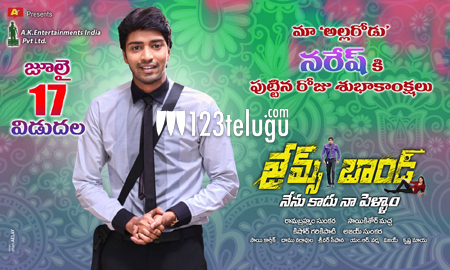 The film’s producer, Anil Sunkar, made the release date official on the occasion of Allari Naresh’s birthday today. James Bond was earlier supposed to release on the 26th June. James Bond is a hilarious entertainer in which Sakshi Chowdary of Manchu Manoj’s Potugadu fame plays a prominent role as Allari Naresh’s wife. The film is directed by Sai Kishore Macha, who earlier assisted Sreenu Vaitla. James Bond is even more special for Allari Naresh as this will be his first release after his marriage.